The proliferation of mobile devices, IP traffic, video-on-demand mobile and home, and Internet of Things continues to drive an exponential grow in data bandwidth. Meeting the data demand requires continuous improvements in bandwidth and capacity for RF base stations modules and optoelectronic modules; associated assembly and test instruments also continue to advance in bandwidth to allow engineers to efficiently build a system and validate its performance. Among all packaging technologies, wire bonding technology has made it possible for reliable interconnection and keeps advancing to push the practical limits forward. The increasing demand on bandwidth and reduced cost is pushing devices into higher frequencies. New challenges and higher performance requirements are therefore unavoidably presented in the packaging industry. It is well known in the industry that lower and shorter wire loops could provide superior electrical performance in the higher frequency modules. In RF modules, one of the most critical requirements is short wire length and consistent low loop height for impedance control. However, when the wire profile has a short wire bond to bond span and low loop height combination region, process engineers usually find it is very difficult to develop robust processes that produce the desired loop height without any occasional flat loops. Palomar’s 9000 Wedge Bonder provides advanced looping control to meet the growing short wire span and low looping challenges from customers to push the limit forward. By accurately controlling the bends and kinks using a complex algorithm, ultra-low loop height (between 50-60um, minimum of 30um) can be produced with very short loop span (less than 12 mils, minimum 5 mils) consistently across a wide range of wire/ribbon sizes. Examples of looping performance are listed below with 0.5x2 mil Au ribbon and 0.7 mil Au wire. Figure 1 below shows an example of ribbon bonding at length of 8 mil, 10 mil, and 12 mil from right to left. The loop height is under 65 microns very consistently across all loop spans shown. The range of loop height variation is below 8um. 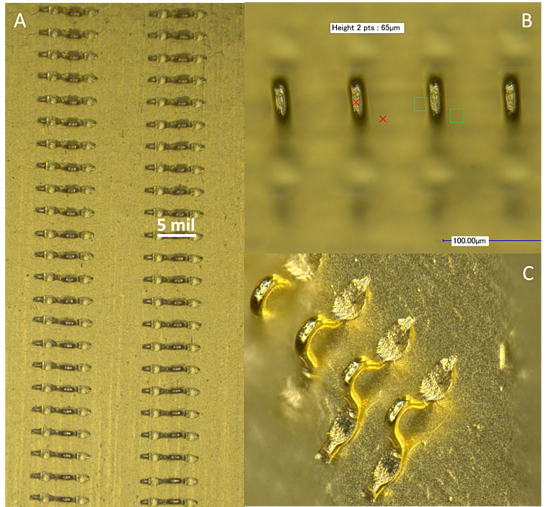 Figure 2 below shows 0.7 mil Au wire bonding. The 9000 Wedge Bonder is capable of generating consistent 65 um loop heights at extremely short loop span (5 mil bond 1 to bond 2). Figure 1. A: An overview of 0.5x2mil Au ribbon bonding loops; B: Loop profile from a zoom in view. Loop spans are 12 mils, 10 mils and 8 mils from left to right for both A and B. Figure 2. Bonding example for 0.7 mil Au wire with 5 mil loop span. A: top view showing loop consistency; B: Loop height measured as 65 um; C: Loop profile close-up view. Additional looping challenges also exist due to the real part die Z height tolerances. As a result, bond 1 and bond 2 relative height varies from one wire location to another, which in turn could cause the loop height variation. However, the 9000 demonstrates the capability of minimizing the effect of bond 1 and bond 2 height variation and maintain good loop consistency. The statistical results in the table below demonstrate the capability of the developed process to hold excellent loop consistency while tolerating a 6-12 µm bond 1 and bond 2 height difference of the bonding surface. All loop heights fall in 25 to 50 µm range with a maximum range of 5 µm. Among the three different bond 1 to bond 2 height conditions, the average loop height difference is less than 5 µm. The 9000 Wedge Bonder has demonstrated exceptional loop performance which satisfies the increasing RF and optoelectronic packaging needs on extremely short and low loop profile with great consistency.